This unique list has been compiled by the Vaad to simplify Passover shopping and to enable consumers to better utilize the information published by the leading national kosher organizations. Please click here to view the complete list. The list has been updated for Passover 2019. Erev Pesach and the first Seder are on Friday, April 19th. The following establishments are certified Kosher for Passover by the Vaad for 2019 for meats, Passover products, and the following take-out menus ONLY. To view the Passover menu, click here. To view the Passover products, click here. Please complete this form before 10:00 AM Arizona time on Friday, April 19, 2019. To authorize the Vaad online to sell your chametz, please click here. To download a Sale of Chametz form, click here. After filling it out please contact the office to submit it. 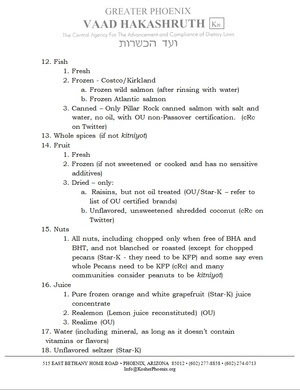 The following list of Kosher for Passover tequilas (even when not indicated on the bottle) is courtesy of SUPERVISORES EN CALIDAD KOSHER of Mexico. For new products added in 2019, scroll down.